Research in the fields of psychology and neuroscience shows beyond doubt that the assumptions about human nature that underpin mainstream economic models are simply wrong. If, therefore, we are to address some of our most pressing global problems, such as climate change and inequality, we need to devise new economic models that accommodate the real complexity of human nature. We now know that the concept underlying the neo-classical economic theory of ‘homo economicus’ – the idea that we are essentially selfish, that we only know our own wishes and act rationally to maximise our own utility – describe only a part of our nature. And the view that all we have to do is allow Adam Smith’s ‘invisible hand’ to function freely for a better world is over-simplified and will not allow us to solve the global problems we face. Are we really that selfish? Instead, we need to move beyond classical notions of “homo economicus” and formulate new models of cooperation that do not focus only on the notion of stable, selfish preferences, but include different motivational systems able to guide different types of human behaviour. Such more realistic and empirically founded models would then allow us to cultivate greater powers of compassion and build these into a new Caring Economics that fully reflects what it is to be human. Neuroscientific studies show that we have many different motivational systems. We can be motivated by power and achievement, by consumption and wanting; but we are also motivated just as deeply by care and systems of affiliation. These have evolved to allow us to form stable relationships, to build trust and to take care of children. Once we realise these motivational systems are common to all humans, and most are even shared with animals, the world starts to look very different. Capacities such as empathy and compassion are part of our human nature, and even shared with other animals. Recent findings demonstrate empathic responses in rats and affiliative care systems have been widely studied in many different species. It is important, however, to distinguish between basic empathic and caring responses, and a more universal capacity for compassion. It is possible that universal compassion is solely a human function. Empathy alone does not necessarily prompt prosocial behaviour. If you empathize with the suffering of another, for example, you may not necessarily help this person. Empathy can also result in empathic distress that may even lead to withdrawal or aggressive behaviour. Feeling compassion, in contrast, is real concern for another person linked to a strong motivation to alleviate their suffering. Take the example of a mother who sees her child crying because it fell down. The mother might briefly empathize with the child and feel its pain. But, a moment later, the mother will take the child in her arms to sooth and comfort it, and help the child to feel better. Here, naturally, the mother turns empathy into compassion and care. It would not have been helpful to the child had the mother cried and displayed distress like her offspring. Both empathy and compassion seem to be natural capacities in humans. However, both responses to the suffering of another are fragile and can also easily turn into their opposite. Our lab studies have shown that people stop empathizing with another’s pain when, for example, that person behaves unfairly to them or is a member of an outgroup, such as a rival soccer fan. In these cases we experience schadenfreude instead of empathy. Humans tend to identify very strongly with what we describe as an ‘ingroup’ rather than an ‘outgroup’. Ingroups may be based on such features as race, gender, age, or religious affiliation. Our ability to empathize and care about others seems to be natural and easily elicited with ingroup members; but the development of compassion and care towards outgroup members, or people unfamiliar to us, requires more training. Such universal or global compassion – caring about groups of people very different to us – probably also requires the involvement of higher cognitive functions. Such universal compassion may be unique to humans. 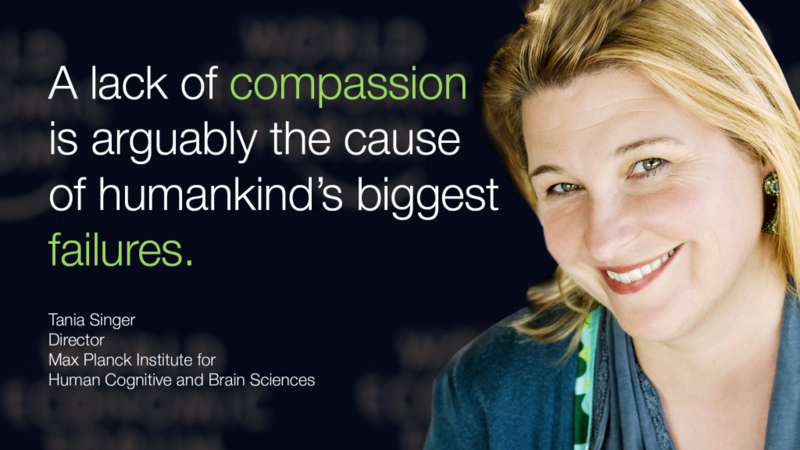 Can you learn to be more compassionate? We investigated whether we can train adults in compassion and prosocial motivation in a large-scale mental training study, called the ReSource project. This, one-year-long programme, performed at the Max Planck Institute for Human Cognitive and Brain Sciences in Leipzig, Germany, involved almost 300 subjects, all without any previous experience of mental training or meditation. Participants underwent intense training, including three, three-month-long mental training modules. Each of these modules started with a silent retreat of 2.5 days, enabling participants to engage in various mental practices and techniques for 30 minutes a day, six days a week. The objective was to develop a wide range of mental capacities and social skills, such as attention, mindfulness, body and self-awareness, coping with stress and difficult emotions, cognitive perspective taking of others, and compassion. Over the duration of this year, we followed our participants scientifically with more than 90 different measures that assessed changes in brains, hormones, health, behaviour and subjective wellbeing. What the first results from the ReSource project and previous similar but shorter studies suggest is that, just as we can exercise a muscle in the gym, so we can also develop our brain and induce changes in both its structure and function when we engage in regular daily mental training. Such mental training is not only able to change brain networks that underlie functions such as attention, how we regulate our emotions and compassion, but also improve health and subjective wellbeing and reduces stress. And, as predicted, our tests showed that compassion training leads to increases in helping, trust and donation behaviour. Our results suggest that such training can change selfish preferences into the more altruistic and prosocial ones that are needed to subserve global cooperation. Preliminary results also suggest that changes depend on what mental exercises have been practised intensively. For example, socio-cognitive skills, such as our ability to understand the minds of others, increased only after training specifically designed to cultivate such “mind-reading” capacities, but not after basic mindfulness practice alone. Furthermore, first results suggest that mental and emotional transformation takes time. Whereas some participants reported that they felt their stress levels were lower after just a few days or weeks of training, measurable biochemical changes may only occur after several months. These findings are, I believe, hugely significant. They show that, through the cultivation of our mind and heart, we can change our motivations from self-centred and selfish to ones that are more caring and affiliative, and these in turn promote prosocial behaviour and cooperation. Understanding other people’s motivations and how to change them is crucial in building more sustainable societies in which we work cooperatively towards common goals. On the basis of these and other findings from psychology, neurosciences and economics, we are now, together with the economist and president of the Kiel institute for the World Economy, Dennis Snower, formulating new motivation-based computational models of economic decision making. These models will enable us to make clear predictions about expected monetary exchange behaviour in economic settings, such as common good problems. These clear behavioural predictions can then be tested in the lab and several of these experiments are already underway. The secular, ethical, mental-training exercises used in the ReSource project could be used in businesses, in political institutions, schools (for teachers and children), and in healthcare settings; in fact, all settings where we find high-levels of stress and burn-out and related diseases. Training programmes should also be introduced in early childhood, so that children learn in a secular and scientifically validated way about ethical values and how to use mental skills and compassion to regulate stress and emotions. Instead of just teaching children knowledge, we should ensure they learn important mental capacities that will serve them throughout their lives. In parallel, policy makers and economists need to change the design of institutions so that they are focused more on collaborative, team efforts. Several governments have, for example, developed so-called ‘Nudge Units’, based on behavioural economics and psychological knowledge; these seek to influence behaviour by providing subtle hints, primes and other suggestions. To enable such science-based programmes to enter and help society we are about to explore the possibility of creating a “ReSource institute”, which could help translate such programmes into specific societal sectors. A lack of compassion is arguably the cause of so many of humankind’s biggest failures. Certainly, we will not successfully tackle our greatest challenges without developing these attributes and fostering what is perhaps a rather old-fashioned ethical notion – that of the Common Good.